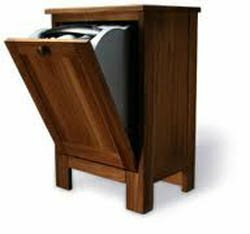 The Ebac Homedry 6000 Dehumidifier is the Ebac 6200 Dehumidifier enclosed in a solid wood cabinet designed to appear as a tasteful item of furniture. The cabinet comes in two finishes, Mahogany and Oiled Oak. Technically the dehumidifier is identical with the Ebac 6200 dehumidifier. The only differences to be found, detailed in the table below, reflect increases in weight and dimensions and a decrease in operating noise level resulting from the wooden cabinet. This item is not reviewed in detail as the additional benefit of the cabinet is purely its appearance and judgements about this are a matter of taste. For commentary on the technical features of the appliance please go to Ebac 6200 Dehumidifier. One point to note is that the cost of this item is considerably higher than the machine alone.